It’s Friday. Yesterday was Thanksgiving. What’s for dinner? Here's an idea first posted last year and still delicious. Too often we suffer post-Thanksgiving relapse and letdown. We just reheat the stuff from last night. Well, the stuffing and turkey and the gravy and those mashed potatoes can rest for still another night. 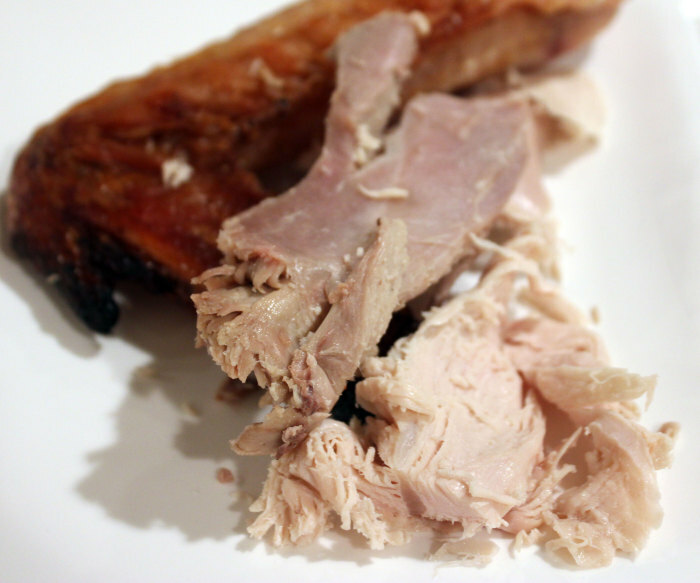 Here’s an idea: use the leftover turkey meat but do it cleverly. Let Friday’s meal be distinctive and distinguished. In her Thanksgiving Cookbook, Holly Garrison devotes a whole chapter to leftovers. Here is a French way to have a main dish that will be dramatically tasty. Holly calls this a sort-of turkey cassoulet. Not there is any question about the meat: it’s turkey. But the sort-of refers to how true to French cassoulet this American idea actually is. Cassoulet is French originating in the South in the region once known as Laguedoc. Today, throughout France, you can buy prepared cassoulets in cans and jars in every supermarket, little grocery store, and neighborhood charcuteries. Some French versions require you to add pre-cooked meats — which is just what Holly does suggest here. Classically, to make cassoulet, meat and beans are cooked separately, then combined and covered with an herbed bread crumb topping, and finally given a last hour in the oven to blend and meld. From yesterday, you have the meat already to go: lots of leftover turkey meat, the darker the better. Cassoulet is rich in flavor, texture and aroma. This meal will be triumph that rivals Thanksgiving, not a post-Thanksgiving minimalist memory. In a large bowl, soak the beans overnight in enough water to cover them by about 3 inches. Discard any beans that have floated to the surface. Drain and sort out any debris. Preheat the oven to 375°F. In a 4-quart Dutch oven or other large heavy ovenproof saucepan with a tight-fitting lid, cook the bacon over medium-high heat until almost crisp. Remove the bacon with a slotted spoon to drain on paper towels and set aside. Pour off all but about 3 tablespoons of the bacon drippings from the pan. Heat the remaining drippings over medium-high heat. Add the onion, celery, and carrot and cook, stirring frequently, until softened. Stir in the garlic and cook, stirring, for about 2 minutes longer. Add the thyme, salt, pepper, bay leaf, and the drained beans. Cook, stirring, for about 4 minutes longer. Stir in the chicken broth and cover the pan tightly. Place the pan in the oven and bake for 1 hour and 20 minutes, or until the beans are tender. Stir in the tomatoes, garlic sausage, and vermouth and continue to bake, uncovered, for 30 minutes. Stir in the bacon and turkey, sprinkle the bread crumbs evenly over the top of the casserole, and dot with the butter. Return to the oven and continue to bake, uncovered, for 30 to 45 minutes, or until the crumbs are lightly browned and the mixture is bubbly.